European LinkedIn (s LNKD) competitor Viadeo has just scored a $32 million round of funding to boost international growth. But what does the company actually plan on doing with the money? I spoke with Derek Ling, the CEO of Tianji, the company’s Chinese arm, to find out more. Based in Beijing, he started building his service 2005 and sold to his French rival two years later. 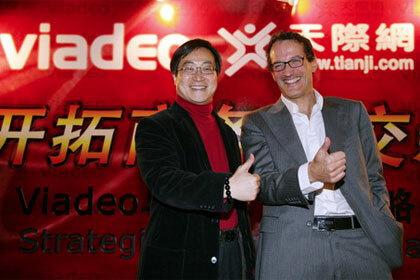 Tianji now comprises the largest part of Viadeo’s business, with 10 million users spread around China. That, he told me, meant that China was an important part of the picture when it came to using the funding. But before you get too excited, Ling says that Viadeo probably won’t look at buying local competitors — largely because there aren’t many who have much scale. Instead, it will look for deals that can boost its sales operation or systems. The same pattern is likely to be repeated in the other markets where Viadeo is active: use the money to improve sales (it works closely with recruiters to make the service a hiring platform), develop the technology or acquire interesting or useful properties. That covers a lot of territories, including various European markets, Brazil, India and a joint venture in Russia. But expansion in Europe and elsewhere “is not as clearly defined yet,” meaning that cracking the Chinese market could be crucial, says Ling. But of course when LinkedIn was at 10 million users, there was no other LinkedIn to stymie its growth — allowing it to expand to the point today when it can claim 150 million users worldwide. Taking on a big beast that already exists won’t be easy: particularly when Reid Hoffman’s got a lot of money in the bank from the company’s IPO, and the business already has users across 200 countries. Ling admits that things are going to heat up, whatever happens. Plus, he says, China is not a homogenous market — something that many outsiders do not realize. One thing that the money won’t be used for, however, is to push the business towards an IPO. After plans to go public last year were shelved, Ling says that Viadeo is focusing on building out — not selling up.